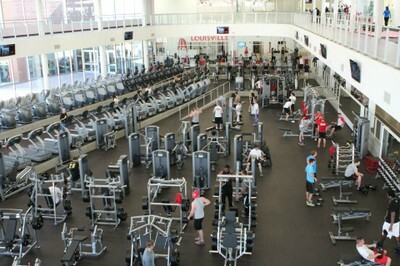 Former students of the University of Louisville are eligible to join a membership program that provides access to the Student Recreation Center. The SRC contains 128,000 square feet of state of the art equipment. There are over 125 cardio pieces featuring embedded entertainment systems so you can watch TV, take in a movie or listen to music while you work out. The main weight room is almost 14,000 square feet and contains a complete line of weight stack and free weight equipment including two power platforms not usually found in non varsity facilities. The center also features an indoor golf simulator, squash and racquetball courts, indoor MAC court, and multiple group fitness studios. 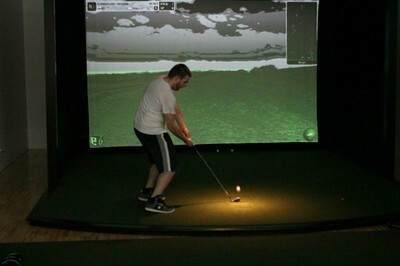 Group fitness classes and use of the golf simulator are free with your membership. We typically have around 30 classes a week ranging from traditional aerobics to TRX Training and spin classes. There is no registration needed to attend any of the classes. Just show up and step in! The University considers anyone who has attended classes at the university to be eligible for alumni status, so a degree is not required for this membership. Memberships are $32 per month and are available in monthly increments from 1 to 12 at a time. This gives you flexibility to not be committed to a membership during times when you might not be able to take advantage of the center. Children must be at least 16 years of age to use any weight room equipment at all facilities. Other additional validations are also available for those who may want to use their memberships to entertain clients, friends or other guests. These additional validations are placed on the members ID and allow them to bring as many guests with them as they have additional validations on their ID. Rates for all of these additional validations are the same as the original member rate. 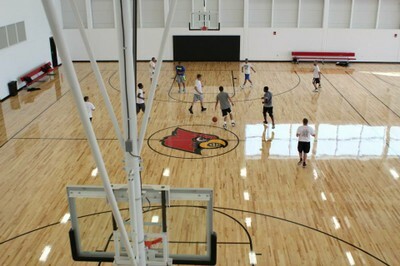 Faculty, staff and retirees of the University are eligible for memberships to the new Student Recreation Center. The cost is only $24 per month and is available in monthly increments from 1 to 12 months. Dependents of members are eligible for memberships at the same rate as the original member. In order for a dependent to join, the host must be a member for a period of time equal to or greater than the length of time desired for the dependent. Be sure to check out parking information at the bottom of this page! Students who were either enrolled for the Spring Semester but will not be taking Summer classes or students that are not enrolled for the summer but can show proof of Fall registration can still have access to recreational facilities by purchasing a Summer Validation. Summer validations are currently $50. Just stop by the Intramural Office, SRC 102, with your valid Spring ID or proof of Fall registration and you will be taken care of! Parking is always somewhat of a challenge on any college campus. Parking for visitors close the the new Student Recreation Center consists of metered parking and UofL permit parking after 4:15 PM. There is a UofL Blue Lot across the street and behind the small shopping center. You may park in that with any UofL permit after 4:15 PM. The lowest cost permit is the Purple which is currently $100 per year. For more parking information please visit the Parking web site. The meters along 4th street are City of Louisville meters. They are .25 per 15 minutes and are free after 6:00 PM weekdays and weekends. There are University of Louisville meter lots at the North end of the SRC as well as just South of Minardi Hall to the South of the SRC. The University lots are automated so you may use a credit card for those meters. We recommend using different meters around the facility as the University lots immediately around the center are "Yellow" lots for resident students and are enforced 24/7. someone can become a dependent member of the SRC.